MADISON - Dane County Executive Joe Parisi announced that Dane County will convene a series of listening sessions to give people an opportunity to discuss concerns about natural hazards and disasters. 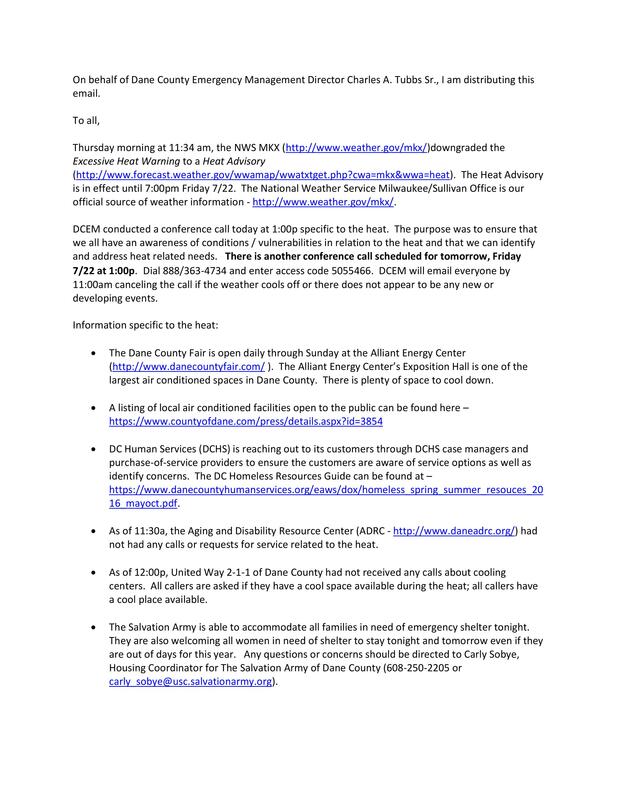 Dane County is in the process of updating its natural hazard mitigation plan and is inviting public involvement and input. Local governments, businesses, and the public are encouraged to attend. On average, each dollar spent on mitigation saves society an average of $4 in avoided future losses in addition to saving lives and preventing injuries. The planning processes is a cooperative effort between the County and forty-one local jurisdictions within Dane County. Natural Hazard Mitigation Plans are important steps that communities take to assess the threat of various natural hazards in their area and make decisions on how to best limit the loss of life and property when the disasters occur. A YouTube Video has been created condensing emergency presentation into a 5 minute video with a link to a survey in which we can track the number of people who watch the video. If you would like feel free to post this on your town/city/village homepage! The link is below! It is a great way to spread helpful information! Weather, go to http://www.crh.noaa.gov/mkx/?n=summer_page. An Excessive Heat Warning is issued within 12 hours of the onset of the following criteria: heat index of at least 105°F for more than 3 hours per day for 2 consecutive days, or heat index more than 115°F for any period of time. This warning is issued when an excessive heat event is occurring, is imminent, or has a very high probability of occurring and conditions pose a threat to life or property. It is important to remember that in a heat wave, heat effects are cumulative. Because elevated temperatures continue throughout the night, persons, animals, and buildings do not get the chance to cool off as much as they normally would. The result may be a reduced ability to recover from heat effects as the heat wave continues. For more information regarding Wisconsin heat waves, go to http://www.crh.noaa.gov/mkx/?n=heat_wave. Dane County has worked with United Way 2-1-1 and RSVP (Retired and Senior Volunteer Program) of Dane County to identify transportation assistance for individuals who cannot access public transportation to cool public locations (i.e. libraries, shopping malls, etc.). If people need transportation assistance to get to a cool location and it can not be provided locally, they should dial 2-1-1 and work with the United Way 2-1-1 call taker. Currently there appears to be enough local facilities where residents can go to cool down. These facilities include shopping malls, libraries, restaurants, etc. To maintain the ability to respond quickly to emergency situations caused by the heat, DCEM is actively seeking information to identify (potential) heat-related needs. Our actions include communications with local agencies including the hospitals, United Way 2-1-1, Dane County Public Safety Communications (9-1-1), Public Health Madison Dane County, and Dane County Department of Human Services. DCEM would expect to open an emergency cooling shelter if conditions warrant. These conditions may include a loss of electricity to a specific area where power could not be restored in a timely manner, transportation is not available to a specific area / population, and citizens of a specific area need more than just a location to cool off (i.e. medical screening / treatment). Please feel free to contact our office if you have any questions or concerns. We may be reached during normal business hours at 266-4330. 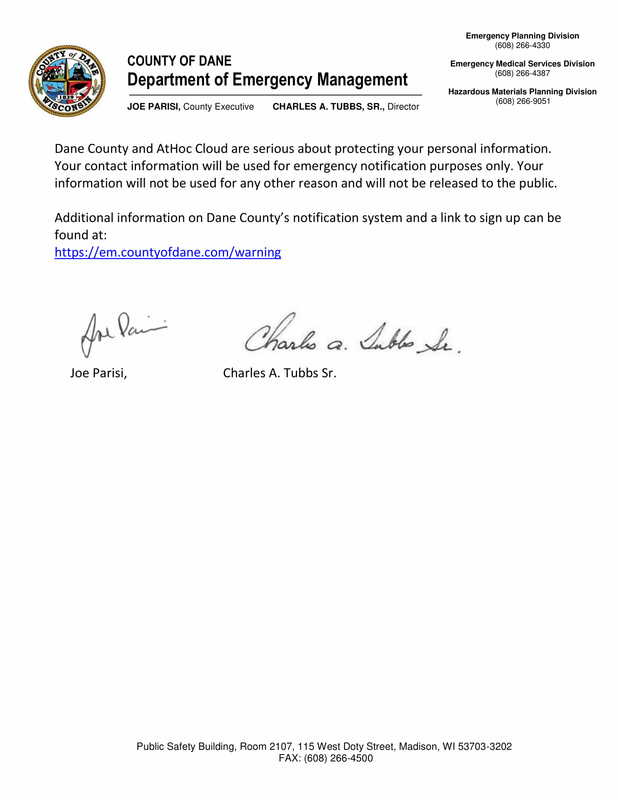 After business hours, the on-call emergency manager may be reached through the Dane County Public Safety Communications (9-1-1) Supervisor at 267-3913. ADMINISTRATION: Municipal officers, including elected officials, clerk and other administrative officers participate in, oversee and support emergency management activities, especially preparedness and response. HUMAN SERVICES: Dane County Human Services coordinate Emergency Human Services in County and Emergency Public/Environmental Health concerns. The American Red Cross and other agencies are primary service providers. LAW ENFORCEMENT: The Dane County Sheriffs Office provides primary law enforcement service for Montrose. 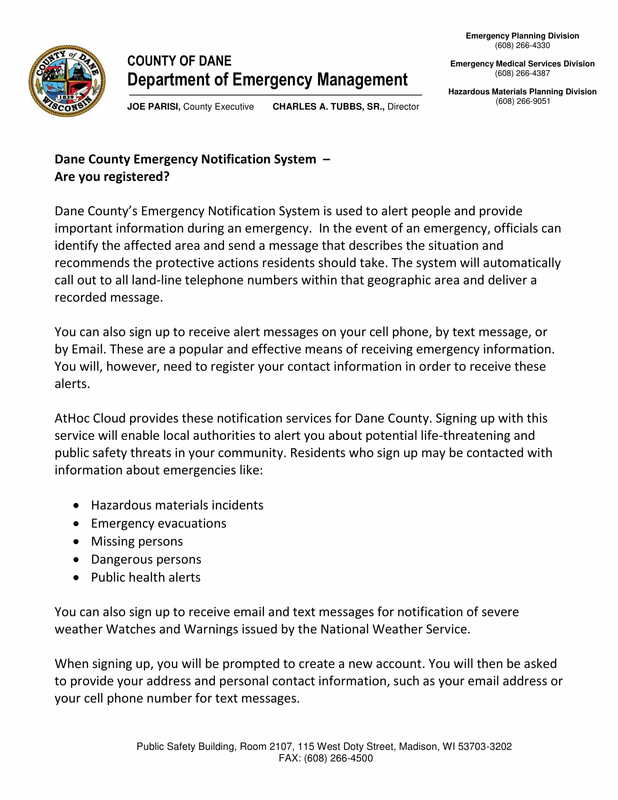 WARNING/COMMUNICATIONS: The Dane County Public Safety Communications (9-1-1) Center coordinates emergency communications and is the primary activation point for the Emergency Alert System (EAS) and the outdoor warning siren system. FIRE SERVICES/HAZARDOUS MATERIALS (HAZMAT) RELEASES: The Belleville, Montrose and Exeter Fire Department provide fire services and limited response to hazmat releases in the community. Dane County contracts with the City of Madison Fire Department (MFD) responds to Level B hazmat releases by contract with Dane County, and to Level A hazmat releases by state contract. EMERGENCY MEDICAL SERVICES (EMS): The Belleville EMS District provides emergency medical care and transportation in Belleville, Montrose and portions of New Glarus, Exeter and Oregon. UTILITIES: Alliant Energy supplies electricity to the community. Wisconsin Gas supplies natural gas to the community. Verizon provides telephone service to the community. VOLUNTEER COORDINATION: Identify potential disaster-caused needs appropriate for volunteer response, identify actual and potential sources of volunteers and volunteer resources, and develop procedures to manage non-affiliated volunteers, skills and resources. PUBLIC INFORMATION: Coordinate emergency public information/media liaison. DAMAGE ASSESSMENT: Assess damages, compile information and provide reports to local and county authorities. EMERGENCY MANAGEMENT: Dane County Emergency Management maintain the County Emergency Operations Center (EOC) and guides and supports county, municipal, public, and private emergency activities through an integrated emergency management system. DEPARTMENT EMERGENCY TASK ASSIGNMENTS: The exercise of individual judgments, initiative, common sense, awareness, urgency, cooperation and coordination is essential in accomplishing emergency task assignments. Departments with emergency task assignments are responsible for developing and maintaining their own internal emergency plans and operating procedures to assure their capability to carry out their assigned tasks. The four phases of emergency activity are mitigation, preparedness, response, and recovery. Actions in all four phases constitute the emergency management program. MITIGATION activities eliminate hazards, reduce the probability of their occurrence, or reduce the effects of unavoidable disasters. PREPAREDNESS activities are necessary to the extent that mitigation activities have not or cannot prevent disasters. RESPONSE activities follow notice of an impending or potential emergency or after its occurrence. RECOVERY activities begin immediately after the effects of the emergency are known and may continue for a number of years after a disaster. During routine activity the established procedures for managing incidents will be used by response agencies. Some events, due to their duration or other factors, may require coordinated incident site management. In those cases, all appropriate agencies will be represented at the Command Post (CP) and support will be provided through established structures. 1. The Community Emergency Operations Center (EOC) will be activated. All local agencies with emergency responsibilities will have a representative at the EOC. Other local, mutual aid and support agencies may be asked to send a representative to the EOC. 2. Command Posts (CP) and staging areas may be established at or near emergency site(s), depending upon the nature of the event. All agencies responding to the site will be represented at the CP. There will be only one CP established per site. 3. Communications will be established between the EOC and CP and with 9-1-1. 4. CP and EOC personnel will jointly manage the incident. CP(s) will direct site operations with EOC support. Certain functions [coordination of multiple CP(s), support of shelter operations, public information, etc.] will be managed by the EOC, including coordination with the County EOC. Most people who live or work in Dane County have been affected by natural hazards in one way or another. Dane County and its residents are vulnerable to a variety of hazards including extreme temperatures, severe winter weather, tornadoes, and floods. These extreme weather events seem to be occurring more and more frequently, often with disastrous results. In fact, many experts believe that the heavy rains, strong thunderstorms, and tornadoes that struck the upper Midwest last summer are a sign of the future trends. The frequency and severity of future weather extremes is difficult to predict, but the trend seems clear. Six of the fourteen federal disasters declared for Dane County have occurred in the last ten years. In fact, according to National Weather Service records, eight of the ten most costly weather events to affect Dane County have occurred since 2000. Combined, these ten events alone account for an estimated $181* million in property damage, crop loss, and governmental response and infrastructure repair costs. As dramatic as these figures are, they do not tell the whole story of damages caused by natural hazards in Dane County. In addition to these large events, almost every year there are smaller, isolated weather events that cause localized property damage and losses significant to the people affected. The rising costs associated with disaster response and recovery have focused the attention of federal, state, and local governments on addressing natural hazards before they occur. Obviously, torrential rains and tornadoes cannot be prevented from occurring. Planning for natural hazards and implementing mitigation measures, however, can reduce the impact of such events when they do occur. Emergency response and recovery costs can be reduced. Property damage and monetary losses can be reduced. Personal injury and loss of life can be reduced. The economic and social impact on the community as a whole can be reduced. In 2005, Dane County and thirteen local units of government within the county collaborated in a planning effort to develop a Natural Hazard Mitigation Plan. This plan was prepared by the county’s Department of Emergency Management under the direction of County Executive Kathleen Falk and the County Board’s Public Protection and Judiciary Committee. The purpose of the plan is to better understand the natural hazards and their impacts on the people and property of the county. But the plan is not simply a descriptive exercise. The plan is intended as a plan of action, identifying a wide range of options to reduce the county’s vulnerability to natural hazards – before the next disaster occurs. The recommendations in the flood mitigation plan have also been incorporated in the county’s comprehensive plan, formally adopted by the County Board and signed by the County Executive in October 2008. 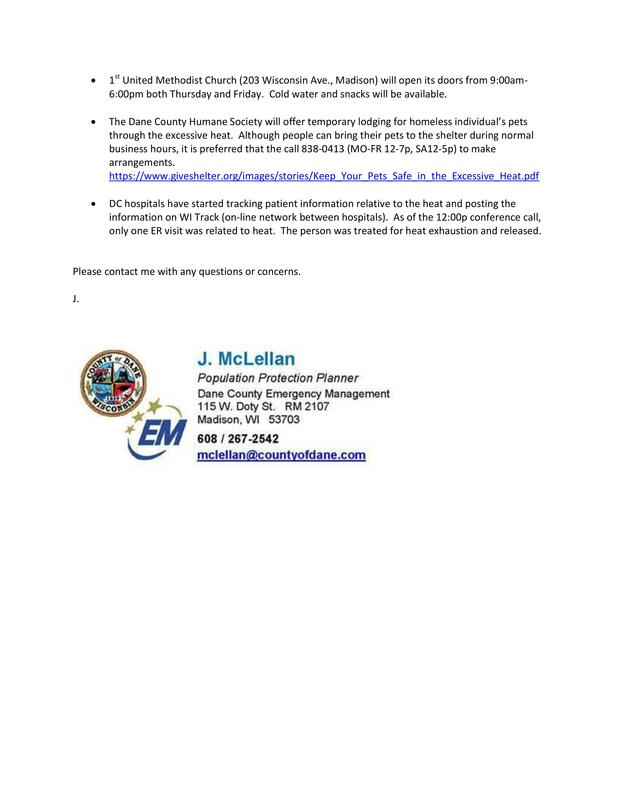 Printed versions of either of these plans can be obtained by contacting Dane County Emergency Management directly at (608) 266-4330. These plans are now being updated. The county has received a FEMA sponsored grant to support the effort. Dane County Emergency Management is taking the lead and has hired a consultant, AMEC Earth and Environmental, to manage the project. AMEC will facilitate the planning process, collect necessary data, and perform other technical services, including updating the risk assessment and plan document. Forty-five of the sixty-one cities, villages, and towns are now actively participating in this process. Members of the community have a very important role in this process. The planning team regards broad public participation in the planning process as an essential strategy for developing a plan that will be effective, supported by the public, and ultimately implemented. The process will provide a range of opportunities for Dane County citizens, public officials, and stakeholder groups to participate and give input in the plan update. Loss estimates provided by the National Oceanic and Atmospheric Administration (NOAA) National Climatic Data Center. The Federal Emergency Management Agency (FEMA) defines hazard mitigation as, “any sustained action taken to reduce or eliminate long-term risk to life and property from natural hazards.” Another way to understand hazard mitigation is as the prevention component of the emergency management process. Preparedness activities are the emergency plans, training, drills, and exercises that individuals, communities and first responders participate in on almost daily basis. These are things done to get ready for an emergency or disaster before it happens. Recovery is the longer-term process of restoring the community back to normal or pre-disaster conditions. This may sound complicated, but we all do many of these things on a daily basis. Consider the example of a family taking their car on a road trip in the winter months. Examples of the hazards of highway travel might include vehicle breakdown, inclement weather, or a traffic crash. Preparedness activities would include purchasing auto insurance and keeping the policy current, maintaining the vehicle so it is in good operating condition, bringing warm clothes, jumper cables, and a shovel, and having a cell phone on the trip. Response activities might include putting on the warm clothes and using the cell phone to call for towing service if the vehicle breaks down or calling 911 if involved in crash. Recovery would be getting the vehicle repaired and back on the road after a breakdown or crash. Mitigation would be assuring that everyone in the vehicle wears their seatbelt while the vehicle is in motion. This is a specific action to assure that if a crash does occur, the occupants of the vehicle are protected and their risk of serious injury is reduced. Another example would be to cancel or postpone the trip if hazardous winter weather is imminent. This action would eliminate exposure to the risk altogether. These same concepts apply to community level hazard mitigation planning. Mitigation planning is a process for county and local governments to identify community-level policies and actions that will reduce the impacts of natural hazards. "Night of a 1000 Trains"
Tornadoes have often been said to sound like a thousand locomotives or planes. In homes and small buildings, go to the inner-most part of the lowest level. Stay away from windows and outside walls, interior closets, halls, and bathrooms are good places to go. If you do not have time to get to the lowest level, get under somethin sturdy like a bed. In school? get under your desk. Abandon mobile homes, cars, and trucks, get into firmly built shelter, if none is available, lie flat in a low spot, ravine, or culvert with your hands protecting your head. Finally, avoid using bridges and overpasses for shelter, stopping under bridges and overpasses only leads to traffic james and the possibility of a greater number of injuries than what would have otherwise occured. Decreasing the air pressure in a house by opening a window does nothing to decrease the damage. Even the strongest tornadoes (EF5 of the enhanced Fujita scale) do not reduce the air pressure low enough to cause a house to "explode". Leave the windows alone. The tornado will open them for you. The southwest corner of a basement is not the safest place to be in a tornado. Actually, the worst place to be is on the side from which the tornado is approaching....usually the south or southwest. You are safer outside of you automobile than inside. The high wind of a tornado can blow your car around much like you can with a wad of paper. Bridges and overpasses are not safe places to be in a tornado. You are higher above the ground, in the stronger wind, and are in the path whree most flying debris occurs.